Internationally known Artist, David E. Doss was born in Forsyth County, North Carolina in 1962. The Artist still resides in the beautiful piedmont region, with his wife Robin, and daughters Taylor & Addi. The peacefulness and beauty of this quaint rural area allow David to nurture and develop his own style of painting. Painting since he was a small child, his talent was recognized early by collectors and local businesses which kept him busy painting. Throughout his art career Doss has been able to share his talent with others, as well as helping to benefit various organizations through his fundraising contributions. Fall of 2003 marked the debut of the Disney Collection with "Mickey & Donald's Fun in the Sun". With much success, Spring 2004 brought the releases of "Mickey's Ice Cold Drinks" & "Mickey's Dance". These images are licensed nationally and share a dual copyright with Walt Disney Corporation. Once again much success brought the licensing of exclusive images available only on property in Florida. Today his images can be found in Disney Theme Parks around the world. In Florida, The Art of Disney stores and various gift shops and resorts. His exclusive property images are available in Florida throughout the year when he is available for personal appearances and signings. Summer 2010 his images expanded exclusively with Disney Cruise Lines. Brisk sales and sold out editions, Doss has collectors across the country and abroad collecting his work. 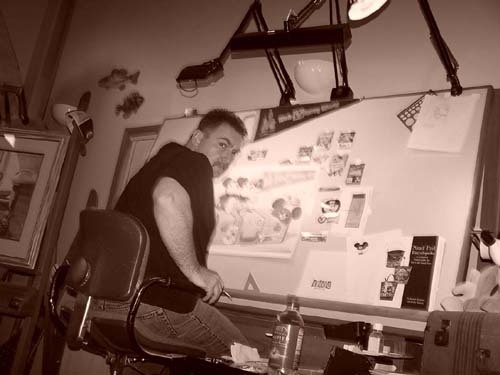 His work can be found in private and corporate collections, including Disney, RJR, Nabisco, Wachovia Bank & Trust , & North Carolina Trust to mention a few. The Art of David E. Doss can be found in Original Watercolors, Giclee', limited editions, open editions, note cards, Holiday cards and keepsake boxes.